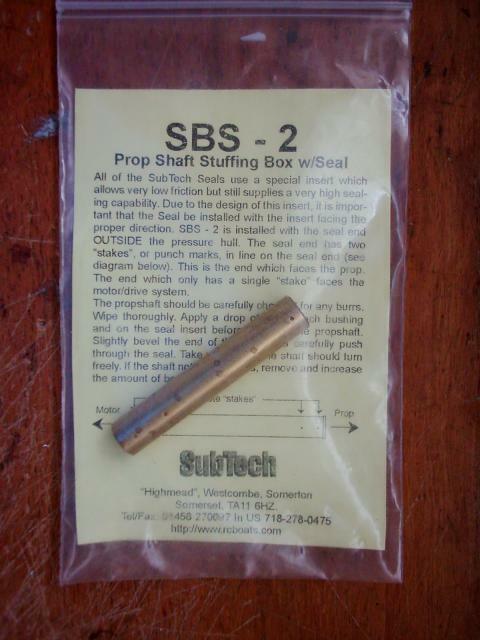 I've just found in my spares box a Sub Tech "SBS-2 Prop Shaft Stuffing Box with seals"...it seems to be a length of brass tube about 2" long with bronze bushes either end, and two internal O ring seals. According to the brief instructions, it must be fitted in one way only, which is described on the packet. I'm guessing it would take a 1/4" prop shaft, which I could then connect to the stub shaft by using a standard Huco type coupling. I take it that this can be fitted into the end cap of a wtc, with the prop shaft passing through it to make a water tight seal? Anyone ever used one of these? Having had a chat to Mark @ MMB, he's now making me up a shaft for the stuffing box, which incidentally measured at 5mm, he's also making the 4mm main prop shaft as well, should be here in a couple of days time.